Succeeding “Failures” or Successive Failures? 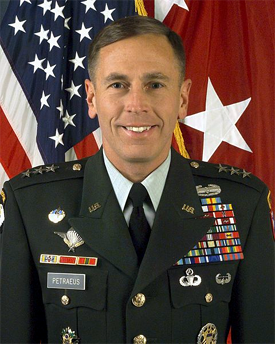 General David Petraeus, counter insurgency warfare specialist, savior of the American mission in Iraq and a man with the most formidable military reputation in contemporary times has taken over as commander of the International Security Assistance Force and U.S. Forces Afghanistan (USFOR-A). Given that his last two predecessors, Generals McChrystal and McKiernan have been asked to resign due to loss of confidence of the political leadership, Petraeus has an unenviable task at hand. Succeeding two perceived “failures” is always a challenging assignment in the armed forces that of assuming charge in active operations so, for Afghanistan is not just the graveyard of empires but also of military generals. Will Petraeus be succeeding “failures” or be another in the chain of failures remains a moot question? We wish him all the success for depending on this is not just the date of withdrawal of US troops from Afghanistan but the fate of an entire nation and its people. The Afghans certainly deserve a general who can finally succeed. With General McChrystal having passed caustic comments on the Vice President, the special envoy Mr. Holbrooke and also US Ambassador in Afghanistan, his stay as the commanding general was likely to have been curtailed and as expected the General has now been replaced by his boss in Central Command General Petraeus. Given Petraeus professionalism the Taliban would be surely worried about his abilities to turn around the situation. What is however important for the counter militancy campaign is a break in momentum of the offensives planned in the south. Operation Omid is now likely to be further delayed and may have to be even launched after September elections or even go into the winters and beyond. All this is adding to scepticism over the deadline of commencement of withdrawal in July 2011. Thus McChrystal’s shadow will loom large in Afghanistan. He had made many innovations in the operations in the country. Soft rules of engagement had been one of the initiatives by General McChrystal which were well appreciated by the Afghans but not in certain military circles. It remains to be seen if General Petraeus who is also a military innovator in fighting counter insurgency will review the manner in which he is likely to do business in the days ahead. While General Petraeus is likely to ensure that there is no increase in civilian casualties he is unlikely to be as stringent in preventing use of force in the country as General McChrystal in whose time as the joke goes even asking for illumination fire by artillery was difficult. On the whole though with a back up General already available in David Petraeus the US and NATO campaign is unlikely to suffer any major setback given that most leaders on the ground already know the General and can adjust to his command style. Had another General outside the loop taken over it would have certainly been a problem for the Afghans as well as NATO. More over General Petraeus is one of the foremost specialists on counter insurgency warfare with proven success in the war in Iraq. He is also thinking general and therefore he should be able to make the right impact on the Afghan scene which is poised critically with the situation set to go either way given the political and the military flux. The Taliban are increasing their disruptive activity across the board in line with Operation Faath which is the code name for their spring offensive in the current year. The primary element of this is likely to be a string of suicide attacks, IEDs and fire assaults along with some attempts to secure district HQs in remote areas in the East and the South. In the latter the attack in Nuristan proved abortive as the Afghan forces recaptured the district HQs after a few days, but Kamdesh district in Khost and some other areas in the South continue to be under Taliban control. The main challenge this time around is that of the IEDs and this is what is likely to see heavy casualties for NATO forces given that the bomb can be planted with ease and has asymmetric capacity for damage. Suicide attacks have greatly reduced in the country down to about 2 percent of the overall attacks but road side bombs and IEDS will be most damaging. There is no doubt that General Petraeus is the best replacement for McChrystal but Afghanistan has an uncanny history of sullying the reputations of many big time military commanders, ask any British or Soviet chief and they will shudder at the though of another full time engagement in the country. Will General Petraeus face the same fate remains to be seen?